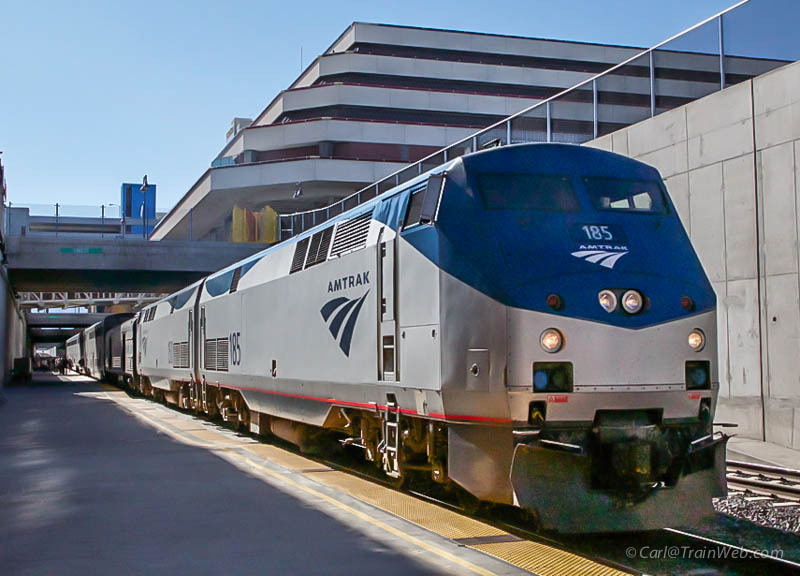 Amtrak California Zephyr stops in Reno daily - once eastbound, about 4:30 pm, and once westbound, about 8:30 am. Check the Amtrak.com app. for Trains 5 and 6 for exact times, or call 1-800-USARAIL and ask for Train Status. 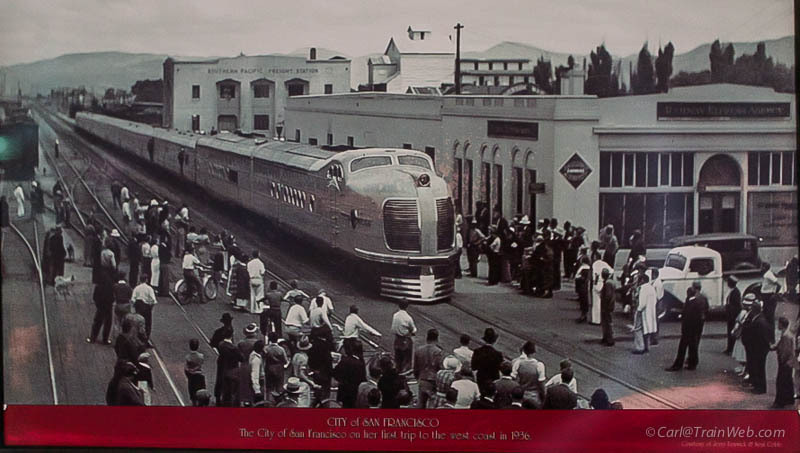 The western terminus of the Amtrak California Zephyr is Emeryville, California. The eastern terminus is Chicago, Illinois. It also stops at Denver, Colorado. Since the station is downtown, it is easy to walk to some of the downtown casino hotels like Circus Circus Reno, Harrah's Reno, Silver Legacy, Whitney Peak, or take a cab or Uber to Sparks and stay at Nugget Casino Resort. 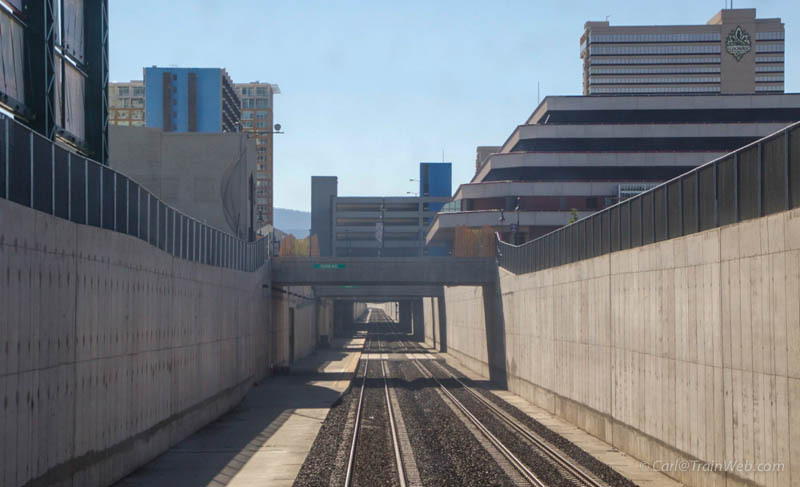 The Reno stop is below street level and does not block the many streets in downtown Reno while stopped at the station. Reno is a crew change station which usually means a stretch and smoke stop. Inside the station are some historic photographs. City of San Francisco, 1936 alongside the station. Now the tracks are below street level. The tracks rise up out of Reno in this view from the last Amtrak car heading east. The track rises to street level east of Reno, before the Sparks, Nevada Station. Sparks, Nevada Station (above) with the two Nugget Hotel towers behind. 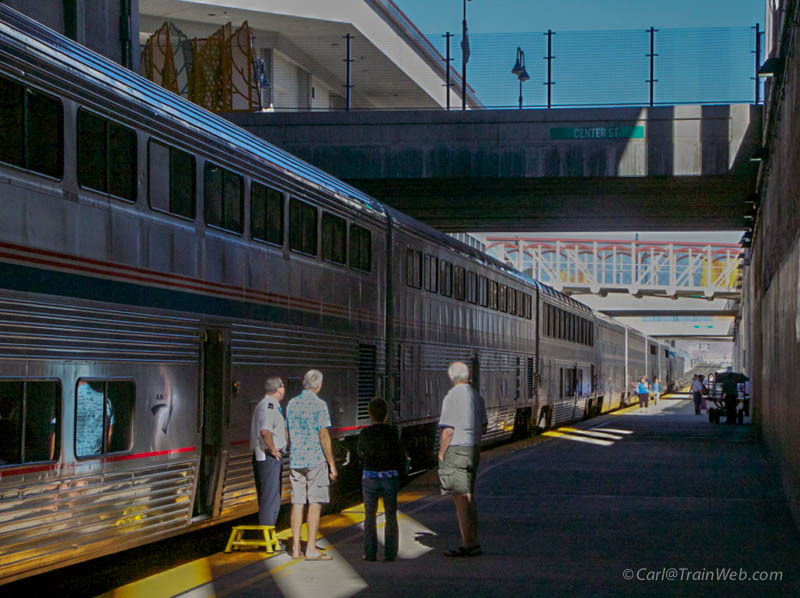 The view from the Nugget Hotel Room 1854 of the Amtrak California Zephyr passing through Sparks eastbound on its way to Chicago on August 5, 2016 during Hot August Nights. Two locomotives on the point, then baggage car, transition (employee) sleeper, two sleeping cars, observation car, diner, and three coaches passing under the Nugget Hotel in Sparks, Nevada. Three sleeping cars at the end of the California Zephyr. The back window of the last car is where I took the photos of the Nugget Hotel 4 photos above. Hot August Nights (HAN) is a world premier classic car event, celebrated its 30th year in 2016. It showcases more than 5,000 pre-1976 vehicles including passenger cars, pickup trucks and emergency vehicles from 38 states and Canada. We like the Show-n-Shines at the Grand Sierra Resort, Peppermill, and Atlantis; nightly cruises in Reno and Sparks; swap meet and Cool Car Corral at the Livestock Arena; auction at the Reno Convention Center, and free classic rock 'n' roll concerts by headliners and tribute bands. First this year is the auction sale of a one-of-a-kind 1939 Futurliner No. 3 Power of the Air Age and a drifting demonstration with ride along for $10. A 2011 study showed the event is attended by 52% males and 48% females, 36% are age 45 to 54 who attend 3.5 days of the event while car participants attend 4.8 days. 50% of the participants are from California, 23% from Nevada, 7% Oregon. Future Dates of Hot August Nights: 2017: August 8 - 13, 2018: Aug. 7 - 12, 2019: Aug 6 - 11, 2020: Aug. 4 - 9. "It was a long, hot desert ride from Orange County, California to Hot August Nights in Reno, Nevada." SP Engine #8 in Victorian Square among the classic cars on display at Hot August Nights. A vintage steam locomotive, cupola caboose and Pullman executive car are displayed along with a depot replica, the restored one room Glendale Schoolhouse and a monument to the Chinese rail workers. The City of Sparks was created when Southern Pacific moved all of their operations from Wadsworth, Nev. On July 4, 1904, SP picked up the houses, the trees, the plants, the chickens, and the people, put them on flat beds, and moved the entire operation 30 miles west to the eastern side of the Truckee Meadows. Until that time, the area was a swamp and a few scattered ranches. SP worked for a year to fill in the swampy wetlands area in what would become the town and the rail yard before the big move. The citizens had a few choices for a town name: Harriman (E. H. Harriman asked to not be honored this way), Glendale (there already was a Glendale stop in California), East Reno and Sparks. The town was eventually named after a Nevada Governor from the area. 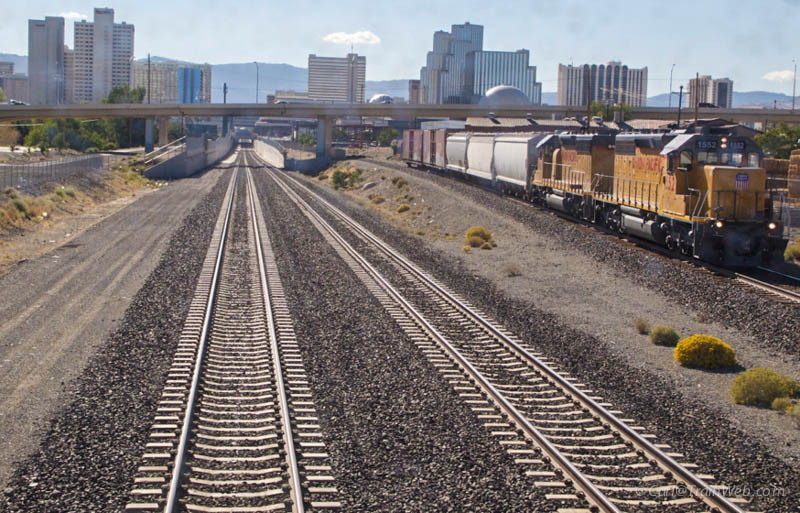 It is fitting the line connecting the east to the west so mirrors our Nevada history: Nevada was admitted to the Union in 1864 in large part due to the transcontinental rail line. The entire community was connected to the railroad: either one worked there or were married to someone who worked there. The schools, the parks, the entire city grew up around the rail yard. The high school is still known as the Sparks Railroaders and uses a steam train in their logo. UP runs the railroad yard and until the 1970s, when Interstate 80 was put through the city, the yard still had the original round house. Today, along with a few original brick maintenance buildings, the original yard tower is still used to oversee operations. 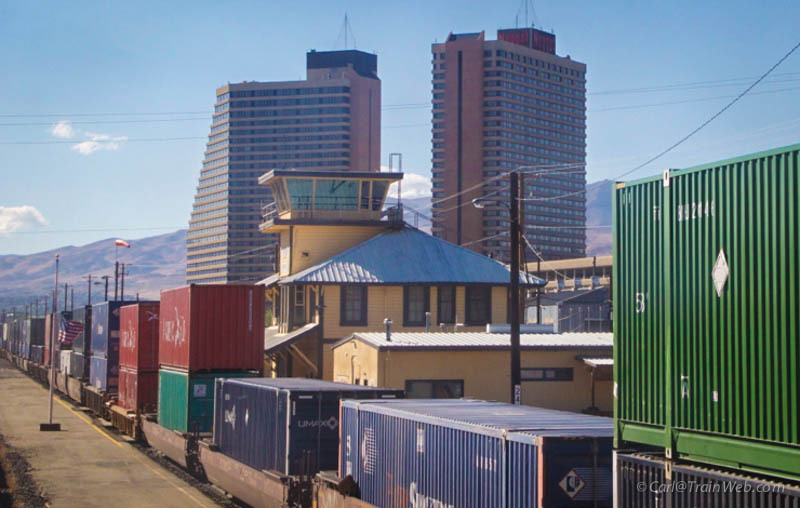 Our town is still known as the Rail City and the rail yard continues to play a vital role to our entire valley's economy. A few years ago, along with expanding the tunnel size over Donner Pass (to accommodate double stacked cars), UP put in a third line in the yard to help accommodate all the traffic coming from the west. Sparks is the site for locomotive and crew changes. UP is a vital business partner to our entire region, and most importantly to Sparks. 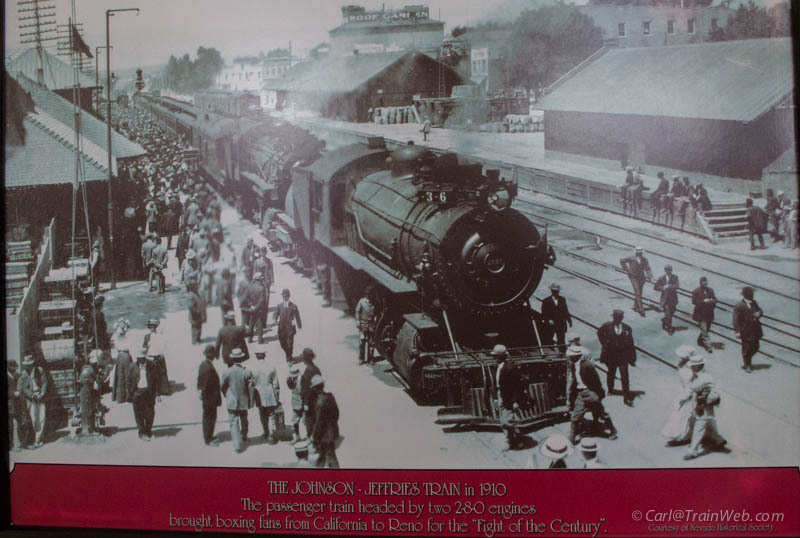 City of Sparks is grateful for the opportunity to be recognized as an important part of the 150 year celebration of the Union Pacific Railroad. A good spot for a classic car photo is in front of the restored one room Glendale Schoolhouse in Victorian Square. Classic cars were on display in Sparks Victorian Square. Brightwork photos are the best to try for with typical hoods-up, trunks-open car shows with marginal background. Reflector in chrome left of the two stars. Grand Sierra Resort has vendors and classic cars in their parking lot. This trailor winches the load and ramp inside. Again, with many cars parked side-by-side, the best photos are closeups of brightwork. Oldsmobile hood ornament. Sometimes you see something so unusual you just need to back up and take it all in. 1955 Chevy 8-door. Some vehicles have descriptive information posted. Some owners add auto accessories and even timely items inside. My reflections in the mirror is incidental. Written so it can be read in a rear view mirror. Flames are not new, but some designs are. Bug-eye headlight lenses always catch my eye. Doesn't the International Harvester emblem look like a man on a tractor coming at you? The big guys had no lock on creative hood ornaments, as can be seen on this Nash. Love the 1954 Chevrolet Corvette. Victorian Square, Sparks, Nevada Controlled Cruise 7 - 10 pm each night. Fred, Russ, and Paul - Ready for the action to begin in Victorian Square, Sparks. You can order any Porsche kit on a VW chassis nowadays. Poster Packard from 2 years ago, still cool with vintage hats of passengers. Not a truck you want to haul hay on. This vendor paints appropriate signs on old Model A Ford doors as art. Since I was born on a farm on Hwy. 50 in southern Indiana, this US 50 sign caught my eye. Cars for sale on the arena floor. Some inside vendors have classic cars of their own. There are some original finds here as well. "Business Coupe" meaning no back seat making room for a traveling salesman to store product. Back area of the business coupe. Vendors in the parking lot. Drift Evolution's drifting and participant rides for $10 in the parking lot by Drift Evolution of Oregon. I heard the tires squealing and smoke rising from the drifiting demonstration, so I asked this young lady to take me to her leader so I could interview the person in charge. The umbrella is a Snapon sold at Summit. Some were circling as individuals. Sometimes 2 raced on the track. Some cars looked pretty nice. Some sent the barriers flying. Some broke tie rods and had to back off the track. Jason, left, was a good PR man for the group and offered me a free ride (which I declined). This young lady took a ride after doning her helmet. Tire changing is a constant activity in the pits. A driver, left, discusses track layout with an Evolution manager. One thing I can identify in the cockpit is a bag of chips. A drone was taking movies. Link to their photos under LINKS below. View of the new Virginia Avenue bridge over the Truckee River where we watched the Cruise. Sculpture in Truckee River park near Virginia Avenue. Our destination before the cruise. Evidently an entry from Oregon. Ready for another night of classic cars passing us. Nothing like an evening when the car show passes you rather than walking around them. This fellow provides rock n roll music throughout the cruises. From this location, you can also see some nice August sunsets with a Cord passing. Cruising under the "Reno, The Biggest Little City in the World" sign. Peppermill Resort "Mill Mile" Show n Shine. Cars under the tent have less reflections to worry about in photography. 1957 grill bar on the 1955 Nomad. Best of Show at Grand Sierra the previous day. Nice to talk with the owner of the favorite '59 Oldsmobile. I saw this car the previous night - Wounded at War 34 Ford. Triple reflection of the POW MIA symbol. Yours Truly enjoying Russ' new hat. Motorsports Auction Group (MAG) Auction at the Reno/Sparks Convention Center, Virginia St.
Reno-based Motorsport Auction Group (MAG) will take hold of the auction gavel for the first time at Hot August Nights from Aug. 4-6 at the Reno-Sparks Convention Center. During the three-day, indoor event, cars will cross the block every few minutes and while the public can explore a multitude of automotive-related vendors and exhibitors. From street rods and classics to special interest and exotic vehicles, gearheads will find an exhilarating automotive array at the new auction, including memorabilia. One of only 12 Futurliners ever manufactured and nine known to exist, the Futurliner No. 3 displays an Allison J-35 jet engine inside and singularly stands out, said MAG spokesman Frank Yaksitch. In 2015, Futurliner No. 11 sold for $4 million at a Barrett-Jackson auction in Arizona. General Motors toured the Futurliners during its 1939 Parade of Progress, a North American traveling exhibition promoting future cars and technologies. Harley Earl styled each Futurliner with Art Deco bodywork, red sides, a white roof and large articulated chrome side panels. At a massive 33 feet long, 8 feet wide and more than 11 feet tall, the vehicle weighs more than 12 tons. It features a gasoline GM 302 inline six-cylinder with a Hydramatic transmission. Dave Kindig and the crew at Kindig-It Design in Salt Lake City restored the vehicle from 2013 to 2014, as seen on the television show "Bitchin Rides." Watch an original film of the Futurliners above. Channel 8 KOLD interview of the Futurliner rebuilder. This guy saw my Media badge and asked for me to take his photo in the 60 Second Eyelift booth. If you want to bid on a vehicle, you must first register and get a bidding number, follow this sign. Once registered, you will receive this backpack of information. Cars inside that are ready for auction. This burlwood looks natural, but it is painted. This was for sale at the auction, basically an electronic piano. The auction was set up much better for spectators like us this year than in the past. Cars are pushed up from the left, auctioned with bids on the large screens, then started and driven off to the right. 2 auctioneers rotated at the microphone each half hour. 1956 Chevrolet Apache Half Ton did not reach the reserve. During the auction of the Bronco, the screen showed the reserve, and the current bid and bidder's location. Shot of the screen whild on the block, this 2000 Chevrolet Corvette reached $13,750, but did not sell. This location has classic car shows other than just during Hot August Nights. Our last night at HAN, we went downstairs from our Nugget Hotel to Victorian Square in Sparks to watch the cruise. You will see some of the same vehicles as in earlier cruises, but surely many you have not seen before. A landscaping company was giving their clients a party at the RR Museum in Sparks. See you next year at Hot August Nights in Reno and Sparks, Nevada?